Yves’ top St Joseph, from old vines around the Chavanay and Mauves communes. A robust, finely structured wine, with firm mineral acidity cutting through the granitic blocks of black fruit. 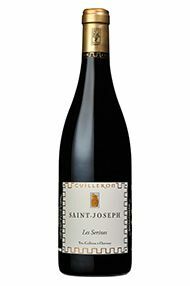 The Wine Advocate - Possessing a terrific northern Rhone bouquet of black cherries, olive tapenade, green olives and a touch of minerality, the 2006 St Joseph les Serines is another juicy, racy, lively red thats drinking nicely today. Like with the Cote Rotie Terres Sombres, it has some elevated acidity, yet I like the balance here better, and it has impressive length on the finish. Drink it over the coming 7-8 years.